It's the last Friday of the holidays. To be honest, I haven't accomplished as much sewing as I had initially hoped, but at the same time, I'm quite pleased with what I have got done. If that makes any sense?? Today was a morning at my place for my merry band of stitchers. 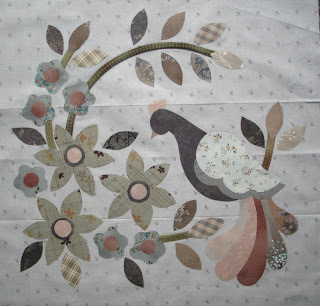 I started appliquing stems onto block three of My Tweets, and tracing the pattern pieces onto fusible web. As the day progressed, and everyone went home (and in between feeding the kids), I've managed to get all the pieces fused onto the background. Now I just need to get settled into some serious machine blanket stitch, as I see that I still haven't quite finished the February block stitching (well, that really should read, haven't started Feb). Progress has also been happening on my Swoon block under construction - with all the smaller components sewn together, and the central star sewn, now it's just a matter of piecing it into ever enlarging segments. Should get finished by the end of April, I would think. Yesterday we visited Whangarei (which is our nearest city) and travelled slightly out of town to peruse the goodies on show at The Country Yard. It was a lovely day and the kids enjoyed the time playing around in Kerryn's gorgeous garden. I, of course, enjoyed my time oogling the fabrics and threads, and catching up with the lovely ladies. I came home with some fabric to add a wee final border to Nadia's Princess winter quilt, plus some wool/polyester batting so it will be all ready to finish off. You get extra special attention at The C-Y, so not only did I come home with the fabric I needed, but the instructions for cutting the border strips using the sizes we worked out in the shop - do you forget what you're supposed to do with your border or binding fabric once you get it home? I know sometimes I've had to rework things out before - but not this time! Just a little touch, but it was really appreciated. Thanks for all the comments about the mysterious Janet, hopefully there will be some photos to share over the weekend. I've had some real laughs! Now I missed seeing your tweet blocks on Thursday, did you have them hiding in that big tote bag? I'm in LOVE with those blocks! 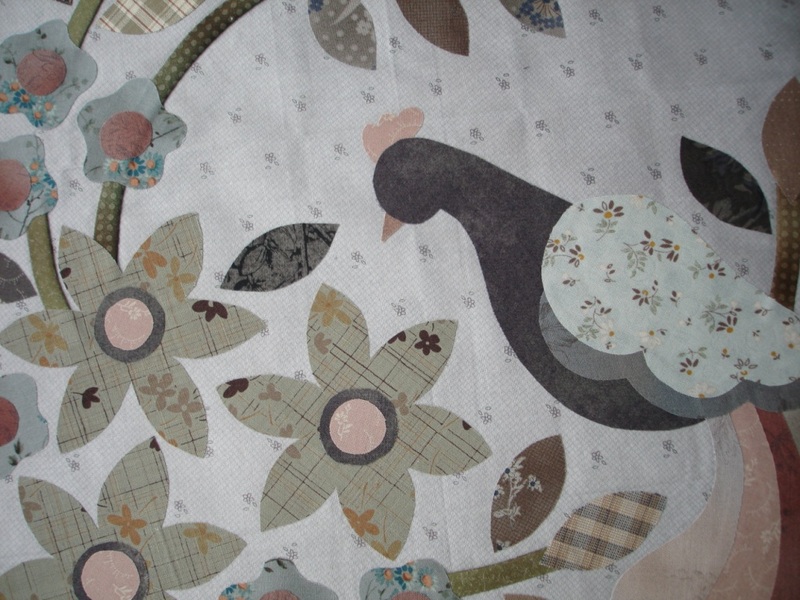 For the purpose of your quilt label for your daughters quilt, the batting is wool/cotton.